The Satsuma City School System believes that children can learn when given the proper support and learning environment. The task of educators is to give the support and structure to the classroom so that learning can take place. Generally, this can be accomplished within the regular classroom. Sometimes, however, the other support services are needed. The instructional support program of Satsuma City Schools provides assistance to students who need interventions. Instructional support staff may monitor student progress, consult with classroom teachers about effective strategies for students, assist students in the regular classroom with activities such as homework, organizational skills, test-taking strategies, class work, and/or a variety of other activities. Instructional support teachers and teacher assistants (aides) work at each school to provide academic support needed by students. When intensive interventions are not effective in assisting students in making progress, a referral to special education, may be needed. The instructional support program also provides special education services to students with disabilities who qualify for services under the Individuals with Disabilities Education Improvement Act (IDEA) 2004. The Satsuma City School System is committed to provide services to eligible students and to include students in the total school program. 1. Who may refer a child for special education services? Any person who has knowledge of a child (ages 3 - 21) suspected of having a disability may refer the child. However, the school is required to present the child to the Response to Instruction (RTI) Problem Solving Team (PST) to recommend, implement, and monitor interventions to address the child's specific concerns. 2. What are the guidelines that regulate the identification, placement, and provision of services to students with disabilities? The Alabama Administrative Code (found on the Alabama State Department of Education's webpage at http://www.alsde.edu/, Sections, Special Education) contains the Alabama Administrative Code which has all of the special education regulations and procedures school districts must follow. A copy of the Special Education Parent Rights is also included on the state website. 3. How long does it take for a referral to be completed? A school has 60 days from the date the school receives signed parental consent for initial evaluation to complete the assessments and conduct an eligibility determination meeting. An IEP team must convene with 30 days from the date of eligibility to develop an Individualized Education Program (IEP) for a child. 4. Once a student is determined eligible for services, what happens? An Individualized Education Program (IEP) is developed by the IEP team. The IEP includes a profile of the student, special instructional factors, transition services (if over 16 years of age), a present level of academic achievement or functional performance, measurable goals/benchmarks, type of special education services, accommodations for the classroom and for assessment, supports for staff, general factors, determination of the least restrictive environment, etc. The IEP is designed to provide the student with a Free Appropriate Public Education (FAPE) to assist the student in making progress toward attainment of academic standards. 5. What are the types of special education services that a student might receive? The type of service a student may receive depends upon the needs of the student. However, to the maximum extent possible, a student must be educated with children who do not have a disability within the general education classroom. Students may receive services in the classroom with accommodations, with support in the classroom from the special education staff, in co-taught classes, in the special education classroom for intervention/remediation, etc. Students with severe cognitive disabilities can receive services in an academic setting separate from the general education setting, if the IEP team determines this is the most appropriate environment. The decision about services is based on the student's individual needs. 6. How long is an IEP in effect? An IEP is in effect for not more than one calendar year. However, the IEP can be reviewed and revised at any time by the IEP team when either the parent or the school requests an IEP meeting. 7. How do teachers know what is in their student's IEP? A student's IEP is accessible to each person responsible for implementing the IEP. In addition, each teacher and service provider must be informed of their responsibilities related to implementing the child's IEP and specific accommodations, modifications, and supports (i.e., training, equipment, etc.) provided for the child. 8. Once a student is eligible for special education services, how long does the student remain in a special education program? A reevaluation must be completed no later than three years from the date of the last eligibility meeting. However, a parent may request that a reevaluation be completed no more than once a year. When a reevaluation is needed, the IEP team determines the types of evaluations that should be completed and meets to decide whether the student is eligible for special education services. If the student does not meet criteria for continuing services, the student is determined ineligible and is dismissed from services. 9. If a student is dismissed from services, is there any support for the child? When a student is dismissed from services, he/she is referred to the RTI Problem Solving Team to determine interventions that need to be in place to help the student transition from special education services. 10. What if a parent disagrees with decisions made by the IEP team? WHAT INFORMATION MUST BE ON THE REFERRAL FORM? HOW LONG DOES IT TAKE TO COMPLETE THE REFERRAL TO PLACEMENT PROCESS? A referral begins with the date that the education agency is notified that a parent, teacher, student, administrator, doctor, or any other person who has knowledge of or interest in the student wishes to initiate a referral. The process from the date the parent signed consent for initial evaluation to IEP development must be completed in one hundred twenty (120) calendar days regardless of any scheduled interruptions in the scholastic year or the scheduled summer vacation. Initial evaluations must be completed within sixty (60) calendar days from the date the school received the signed parent consent for initial evaluation. Eligibility MUST be determined no later than thirty (30) calendar days from the date initial evaluations were completed. An IEP meeting must be held and placement made within thirty (30) calendar days after the student is determined eligible. The IEP Team is a team of people who meet to make decisions about evaluation, eligibility, and programming for students. 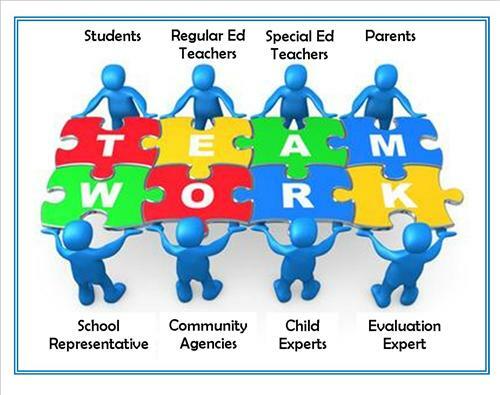 WHO IS INVOLVED IN THE IEP TEAM? WHAT ARE FUNCTIONS OF THE IEP TEAM? Reviews the existing data and determines what, if any, additional data is needed for reevaluations.